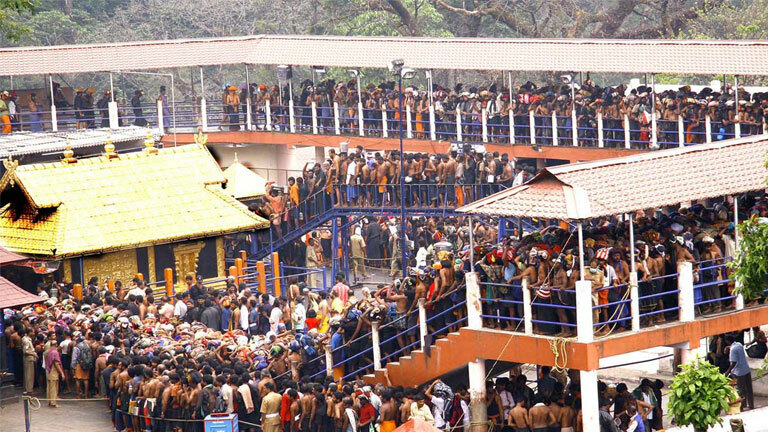 A renowned pilgrim centre atop the rugged hills of the Western Ghats, the holy Sabarimala Temple is dedicated to Lord Ayyappa. The main pilgrimage is undertaken between November and January. Devotees undergo rigorous penance before starting on the pilgrimage. Regardless of caste, creed and colour they wear black or deep blue dhoties (traditional Kerala wear for men) and carry on their heads, cloth bundles containing traditional offerings like coconuts filled with ghee, camphor and rice. When it comes to female devotees only females who are past their menopausal age or have not attained puberty are allowed into the precincts of the shrine of the Lord who is considered to have remained unmarried.